We make no secret that engagement is the number 1 passion for Chris Cooper, Business Elevation. With surveys repeatedly showing that over 80 percent of employees are not engaged in their jobs and UK businesses having one of the poorest engagement levels in the G12, scope for performance improvement is astonishing. Organizations need engaged team members and customers. They want to attract and retain great staff but how do you actually transform engagement? With many HR Professionals citing this as the number one area for focus in 2018, we support our clients with the essential information and approaches to elevate engagement to the next level. 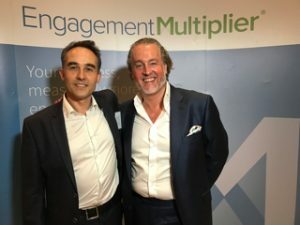 Chris Cooper Business Elevation have therefore partnered with Engagement Multiplier and are committed to contributing to Engagement Multiplier’s global vision, of helping 100 million people to become measurably more engaged. Engagement Multiplier have the best engagement survey tool in the market. The survey enables anonymous dialogue between recipients and clients and provides a brilliant visual summary of the situation. We then support our clients by helping them to transform their current situation into higher levels of performance.